The snow cone machine uses regular bagged ice that you can find at your local grocery or convenience store. This machine has a drainage hose for the melted ice. Please be aware that the hose will need somewhere to drain, whether that is in a bucket or simply on the ground outside. 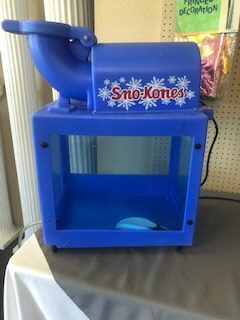 * Please call us with any questions about our snow cone machine blue 3 rentals in Kennewick, WA and Richland, WA.